Maximum size: about 13 mm. 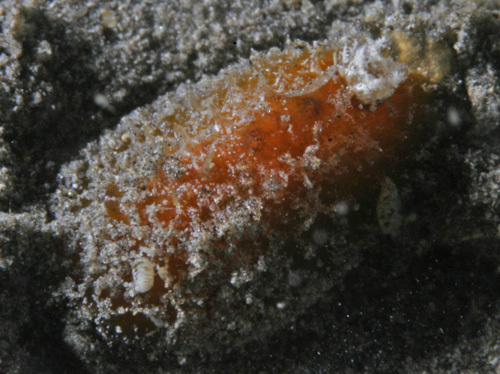 Identification: This is a yellow species with white branchia and mottled rhinophores. The center of the notum is decorated with a series of dusky patches. Natural history: The one known Thordisa sp. #14 was found at a depth of about 4 m (12 ft) crawling in fine sediment near rocks. Taxonomic notes: It was first recorded in Hawaii from Honokohau Harbor, Big Island by Paul Okumura on May 31, 2014. In its background color and dusky mid-line patches, it's reminiscent of Thordisa sanguinea Baba, 1955 as illustrated on Bill Rudman's Okinawa site. However, the branchia (in both color and form) don't appear to match that species. Photo: Paul Okumura: about 13 mm: Honokohau Harbor, Big Island, May 31, 2014.